Line baking sheet. In a bowl stir together flour, oats, sugar, baking powder, baking soda and salt. Using a pastry blender cut in butter until mixture resembles coarse crumbs. In a small bowl whisk together buttermilk and egg. Add to flour mixture with walnuts. Stir with fork until just evenly moistened (dough will still look crumbly). Scrape dough onto a floured surface and, with slightly floured hands, work together into a ball. Divide into 8 equal pieces and gently pat each piece into a 2 1/2 inch round, about 1 1/2 inches thick. Place rounds 2 inches apart on baking sheet. 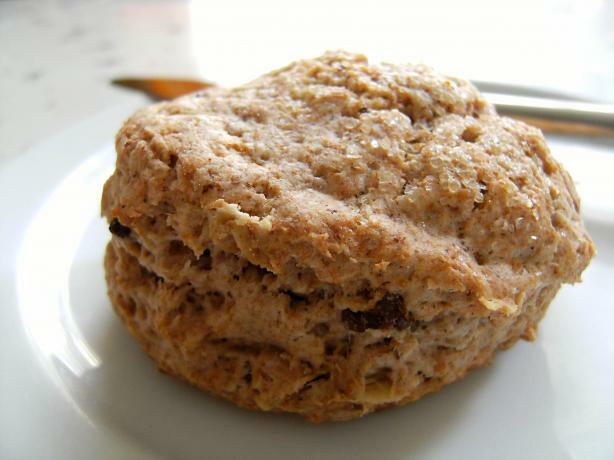 Bake scones until tops are browned, 30 minutes. Cool for about 10 minutes on baking sheet before serving..